Modern semiconductor devices have reached high current and voltage levels, and their power-handling limits can be extended if they are used in multilevel converter configurations. To create high-performance and reliable control designs, however, engineers need in-depth understanding of the characteristics and operation of these topologies. Multilevel Converters for Industrial Applications presents a thorough and comprehensive analysis of multilevel converters with a common DC voltage source. The book offers a novel perspective to help readers understand the principles of the operation of voltage-source multilevel converters as power processors, and their capabilities and limitations. The book begins with an overview of medium-voltage power converters and their applications. It then analyzes the topological characteristics of the diode-clamped multilevel converter, the flying capacitor multilevel converter, and the asymmetric cascaded multilevel converter. For each topology, the authors highlight particular control issues and design trade-offs. They also develop relevant modulation and control strategies. Numerous graphical representations aid in the analysis of the topologies and are useful for beginning the analysis of new multilevel converter topologies. The last two chapters of the book explore two case studies that analyze the behavior of the cascade asymmetric multilevel converter as a distribution static compensator and shunt active power filter, and the behavior of the diode-clamped topology configured as a back-to-back converter. These case studies demonstrate how to address the associated control problems with advanced control and modulation schemes. 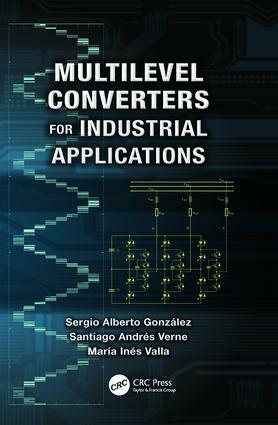 Examining recent advances, this book provides deep insight on the design of high-power multilevel converters and their applications. It is a valuable reference for anyone interested in medium-voltage power conversion, which is increasingly being used in industry and in renewable energy and distributed generation systems to improve efficiency and operation flexibility.